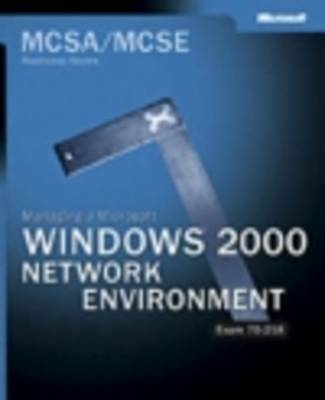 If you took Microsoft Certified Professional (MCP) Exam 70-218 today, would you pass? With the READINESS REVIEW MCP exam simulation on CD-ROM, you get a low-risk, low-cost way to find out! This next-generation test engine delivers randomly generated, 50-question practice exams covering real MCP objectives. You can test and retest with different question sets each time-and with automated scoring, you get immediate Pass/Fail feedback. More important, you get answers to these four critical questions: * What do MCP exam questions look like? * In what topic and skill areas am I proficient/deficient? * How should I focus my studies? * Am I ready for the real exam? Use this READINESS REVIEW to evaluate your proficiency with the skills and knowledge tested on Exam 70-218, including: * Creating and securing file, print, and Web resources * Configuring the network infrastructure * Managing servers and client computers * Administering Active Directory organizational units and Group Policy * Implementing and troubleshooting remote access After completing your practice sessions, use the companion book to review helpful explanations for all responses-right and wrong-and to identify areas for further study. Sharpen your test-taking skills, save valuable time and money, and build your confidence for the real exam with READINESS REVIEW. It's the smart way to prep! For customers who purchase an ebook version of this title, instructions for downloading the CD files can be found in the ebook.